Peering inside our mind and capturing images of our thoughts has become a preoccupation in much of neuroscience. It's also an unlikely part of the light show at a Mickey Hart Band concert. Yes, the musician best known as the percussionist for the Grateful Dead for more than 20 years jams with a light show powered by his mind. "It's totally captivating," Hart says. "And I feel very high when I do it." "And it's made me overall very happy in my life," Hart says. Hart has a lot to be happy about. At nearly 70, he's still healthy and still touring. On his most recent album and in his upcoming concert tour, Hart dons a goofy black cap studded with electrodes. 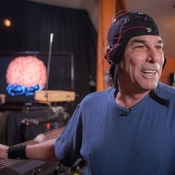 The cap — and EEG data it derives from Hart's brain — drives his concert's light show. At the concert, images of Hart's brain soar 40 feet in the air and change color to reflect different types of brain waves detected by the EEG. "I was just looking at it and watching it fire, and you see the colors moving and the different rhythm patterns and realizing, that's me," he says. Working with researchers at the University of California at San Francisco, Hart's bandmates arbitrarily assigned musical notes to different brain waves and have sprinkled those sounds throughout their songs. But Hart's interest in brain science dates to the '80s. His grandmother had dementia. For years, she didn't seem to recognize him and largely stopped speaking. "And I played my drum for her and she spoke my name," he said. Hart became convinced that music could be a powerful therapy. Eventually that lead him to Adam Gazzaley, a neuroscientist at UCSF. "So [Gazzaley] developed the technology — and his lab has — that allows me to see my brain in real time and to hear the electrical stimuli of the brain," Hart says. For Hart, that idea of processing data in real time was important because he wanted to jam with his own brain. "I want to be dynamic with it, I want to have a conversation," he says. Obviously this isn't science — it's rock 'n' roll — but Gazzaley says the technology Hart's using in his light show and concert actually could have uses in the lab. "What most scientists do in the lab is collect the data and then they do something known as post-processing, where we analyze it for months and figure out what's going on," Gazzaley says. "Here, what we're doing as best we can is showing the data in real time as it's being generated." To make that happen, Gazzaley hooked that goofy black cap studded with electrodes to some of the fastest graphical computer processors on the planet, the same equipment that powers the Titan supercomputer at Oak Ridge National Labs. And this got Gazzaley thinking about how he could use similar techniques in his own lab. "If we had better real-time data from the brain then we could use it, for example, in neurofeedback experiments, where people interact with their brain rhythms" he says. Earlier this week, Gazzaley published a paper in Nature that demonstrated playing a brain-training video game for a month could improve the multitasking abilities of people in their 60s, 70s and 80s. As the players got better at the game, the game got harder. "What we want to do [next]," Gazzaley says, "is feed the brain data directly into the game mechanics so that the game essentially knows what's going on in your brain in real time and could push on the different processes." Gazzaley is designing similar experiments using music. In the past, the tasks in these experiments would get harder as players got better. So if you were able to match a specific beat, the next rhythm would be more complicated. But beating out a rhythm is actually triggered by a chain of events in your mind. "You have to sensory process the information. You have to do something known as sensory motor transformation and motor planning and then you actually have the motor act itself," Gazzaley says. If something goes wrong and you miss a beat, it could be any one of those neurological functions breaking down. "But if we could directly target the different processes almost like a surgeon, we could go in and really sculpt how the brain works and maybe get better improvement," Gazzaley says. That vision is a long way — and many experiments — from reality. And those experiments could totally fail. But Gazzaley says if they do work out, Mickey Hart's light show and those fast processors he is using to power it will deserve a piece of the credit.